Everyone knows someone who is dating a person nobody likes. Everyone tells them they are no good and usually have legitimate reasons or proof even for this and the person still continues to date the person. The reason behind this is simple, they are in denial. 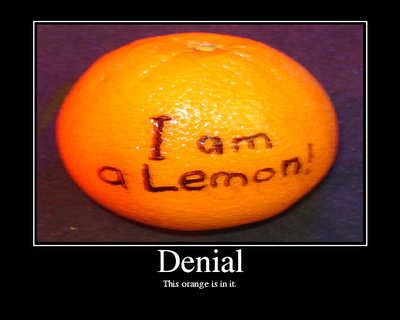 The definition of denial is the disbelief in the reality of a person, place, or thing. The denier makes an unconscious decision that their feelings about whatever it is that they are denial over, is more threatening then just dealing with the issue. One major form of denial is minimizing, we all do it about, mostly about People do this with personal problems such as drug/alcohol problems or health problems. This is the leading cause of many things that are not going right with a person and directly effects personal goals of happiness. Everyone has something they are avoiding that is weighing on them that they just don’t want to deal with. Denial over the a persons’ true colors, a problem at work, relationship problems, and etc. Denial is like a brick wall, you know there is something on the other side but are unable to see it until you want to. Like a brick wall, denial is a hard wall that must be chipped away at to break through. People have a tough time with denial as it is a change that must be made within ourselves and it is scary to me because it is too close to craziness. To object to something so strongly that you are no longer dealing with reality…So take some time to really think over your problems so that you can find a solution. It may be unpleasant to deal with your problems head on but in the long run it will provide you with a healthier mindset and provide you with better problem solving skills for a happier future..